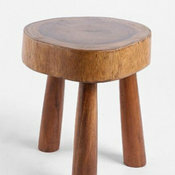 I love the modest size, modern design and rustic wood. 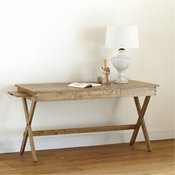 This desk is perfect for a legitimate home office or as a desk/console behind a sofa. Make the office double as a guest room with a sleeper sofa. 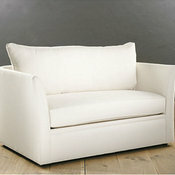 This petite sleeper has graceful lines as a sofa and folds out into a twin bed when necessary. 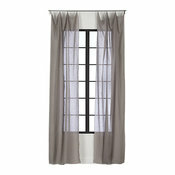 These light gray linen curtain panels are great for the office/guest room combo. When the room is functioning as an office, the panels let natural light filter in. When the room is catering to a guest, the panels can be pulled over the window for privacy. A large oriental rug is the statement piece in this home office. The bright colors breathe life into an otherwise neutral space. Use a small wooden stool in front of or next to the sleeper sofa so that guests can keep a book and a glass of water nearby. 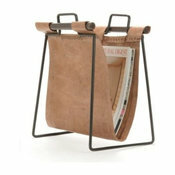 An iron and leather magazine rack holds current inspiration within arm's reach. Guests can peruse the glossies as well. 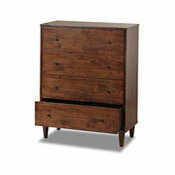 A clean-lined dresser provides closed storage for office supplies. Just remember to leave a drawer empty for guests. 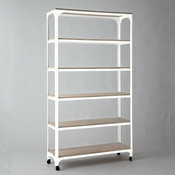 I would use one of these wood and metal shelving units in an office corner for storage. I'd fill it with bins and baskets for an organized look. The wood matches the desk, while the metal is a cool contrast. 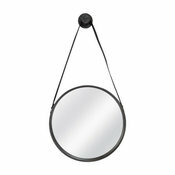 Hang a mirror to bounce light around the room and give guests a chance to check themselves before heading to the breakfast table. 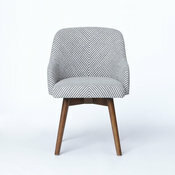 Finally, a comfy and stylish desk chair! The gray and ivory stripes lend subtle pattern to the room, and the warmer wood tone proves that all wood finishes within the same space don't have to match. 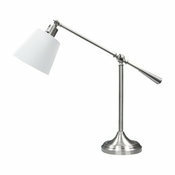 An adjustable swing-arm table lamp is the perfect companion to the Campaign desk. It's practical and stylish. 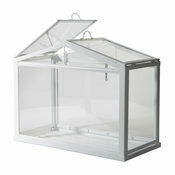 Use a mini greenhouse to add life to the office. 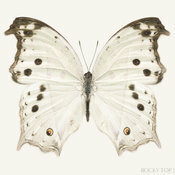 Place it on the desk or shelving unit where a pop of green will get noticed. 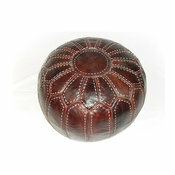 A hand-stitched leather floor pouf can be moved around to elevate feet at the desk or at the sofa. 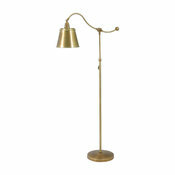 Throw in another metal finish with this brass floor lamp. 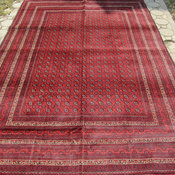 Place it near the sofa, and guests can read in bed. How great is this decal chalkboard? 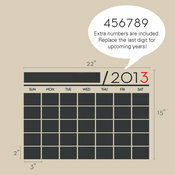 It is pre-spaced on a transfer sheet, making application a cinch. Write on it with chalk or a chalk pen and never miss an appointment, practice, deadline, meeting, phone call or payment again. 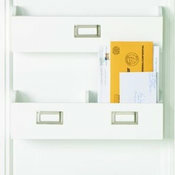 Keep mail, bills and papers from cluttering horizontal surfaces with this wall organizer. Handy label holders denote what goes where. 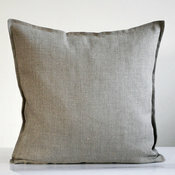 Toss a few gray linen pillows onto the sleeper sofa to welcome clients or guests. 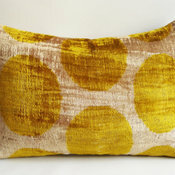 Kick it up a notch with a dose of happy yellow in the form of a throw pillow. 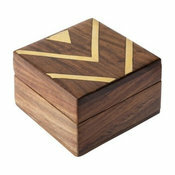 Store keys, Post-It pads, receipts and more in this handsome wood and brass box.